← How to get VeryPDF Printer Capturer? Situation – We deliver training courses. Recently we moved to providing course notes in digital format only. That means our Attendees have to markup their course slides digitally while listening to the Instructor during the course. Adobe and other PDF markup / annotator tools have far too many features and are way too complex for the level of fast and simple slide markup / annotating that needs to be done. As a result the Attendee has a challenge to keep up with the Instructor while also making valuable notes within their digital based slides, notes that will be very helpful later on. Requirement – We need a simplified PDF markup / annotator tool with a small number of easy and fast to use markup / annotator functions. Solution – We need a very simple PDF markup / annotator software tool that has our company branding on it. - Preferably installable on Mac or Windows but we will accept Windows only to start with a simple installation process that can be done by an end user without admin rights. Well that is it. 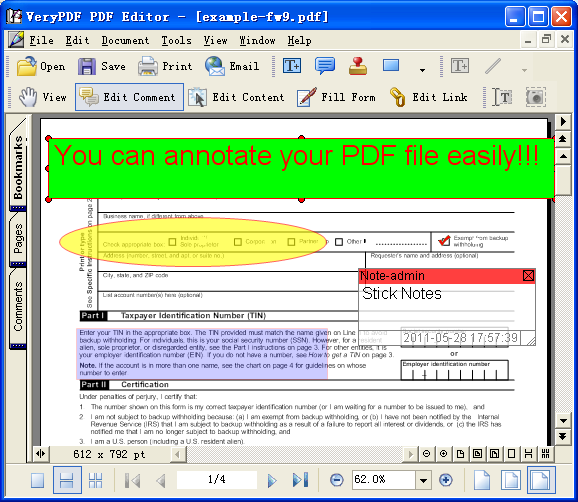 We require a simple PDF mark up / annotator software tool. We have no idea what it will cost so please give us a quote. If the current version of VeryPDF PDF Editor software meets your requirements, you can purchase it from our website directly. If the current version of VeryPDF PDF Editor software doesn't meet your requirements, we can modify PDF Editor software to best meet your requirements. We suggest you may download and try VeryPDF PDF Editor from our website first, if you encounter any problem with this software, please feel free to let us know, we will assist you asap. I’m looking for a PDF Editor SDK which has View, Edit, Draw, Highlight, Add text, Add pictures, add hyperlinks, add shapes, etc. functions, this will work on a server and supports both Website and iPad app. How I can use your HTML5 PDF Annotator & Editor in my website? How to set a callback web page URL and File ID to VeryPDF annotator application? How to get the annotated PDF file? How to add text annotation, image annotation, signature, etc. to PDF pages? How to highlight text in PDF by PDF Editor? This entry was posted in PDF Editor and tagged annotate PDF, edit pdf, pdf annotation, PDF annotator, pdf editor, pdf markup. Bookmark the permalink.